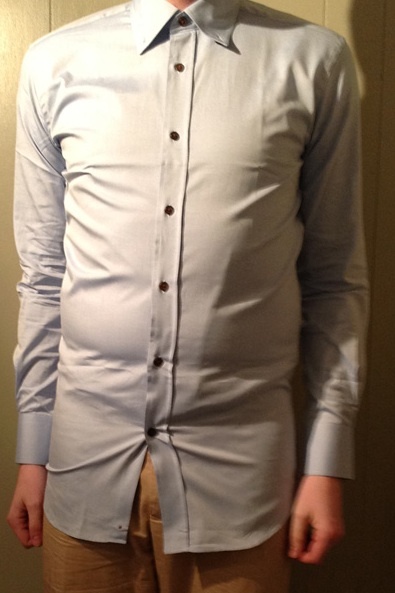 I built the Shirt detective site because I have spent many hours in London and New York searching for dress/formal shirts that fit me. I have relatively wide shoulders and a small waist so finding shirts that fit is difficult and there was little help on the Internet. This is an example of what we want to avoid. Styleforum.net and Dappered are good online sources, but the forum format sometimes means it’s difficult to find specific information without reading through pages of responses. So I learned to use WordPress and have set up this Shirt detective site in the hope that it will help you find a shirt that fits. I can only work on Shirt detective part-time, so it’s not exhaustive, but I keep adding information and updating the site over time. More detailed information on Hugo Boss is probably next. If there are specific retailers you would like to see added then please contact me through the email or twitter shown at the bottom of the page. There are affiliate links on the site and I make a small commission if you buy through some of the links. I’m aiming to make the site comprehensive, so I’ve also included information on retailers like Christian Benedict, Dalvey and Standard Shirts, even though they don’t have direct affiliate links. Thanks for visiting. I hope you find the site useful.